Buckeye Valley’s Andy Nero (6) winds up for a shot during the first half of Monday’s showdown against visiting Bexley. As senior Carson Artrip came off the field after the Buckeye Valley boys lacrosse team held on for a 12-10 victory over Bexley Tuesday night, head coach Matt Garber called him the game’s most valuable player. Artrip scored two of the Barons’ four goals in a 64-second span that turned a one-goal deficit into an 8-5 lead. BV never trailed again. Artrip also scored with 1:35 remaining in the game after Bexley had run off four straight goals to pull within one. 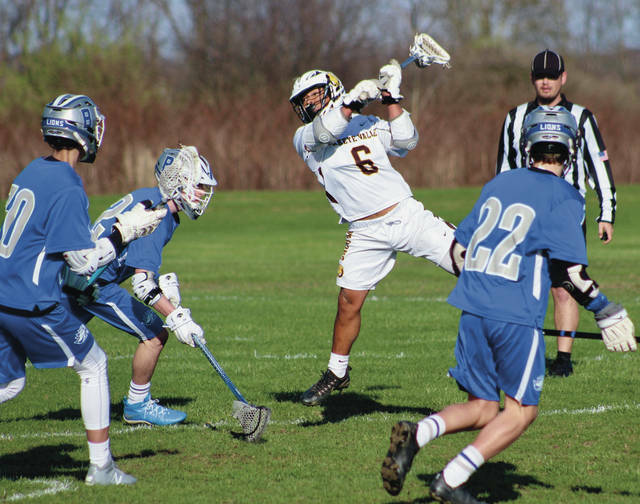 The senior attacker/midfielder attributed his success to Zach Garber’s work on the face-off. Garber won 21 of his 24 attempts. He also scored twice and assisted on two others. Andy Nero led the Barons (2-4) with five goals and assisted on a sixth, which tied the game 1-1 eight seconds after a Bennet Bartz goal gave the Lions an early 1-0 lead. Artrip scored the tying goal – the first of his four goals – and Zach Garber won the ensuing face-off and scored unassisted 13 seconds later to give the Barons a 2-1 edge with 7:32 left in the first. Nero scored his first to give BV a 3-1 lead a couple minutes later. Bexley responded with four of the next five goals to take a 5-4 lead. Charlie Britt hooked up with Hunter Hilgeman on the first two goals for the Lions. Artrip and Nero both scored third-period goals off feeds from Reid Lajeunesse to push the lead as high as 10-5 with the latter coming with 11 seconds left in the third. Lajeunesse led with three assists and added a tally. Bexley got hot in the fourth with four straight goals and five out of six – capped by a Jack Dawson tip-in on the left side off a Tyler Behl feed from behind the goal to cut the BV lead to 11-10 with 1:42 remaining. But, Zach Garber won the ensuing face-off and fed Artrip to end the threat. Connor Brant stopped seven shots in goal for BV. Hildgeman, Britt and Dawson each scored three goals apiece and Britt, Behl and Carter Brenner each dished out two assists to lead the Lions (5-5). Next up, BV travels to Jonathan Alder Wednesday night at 8 p.m.